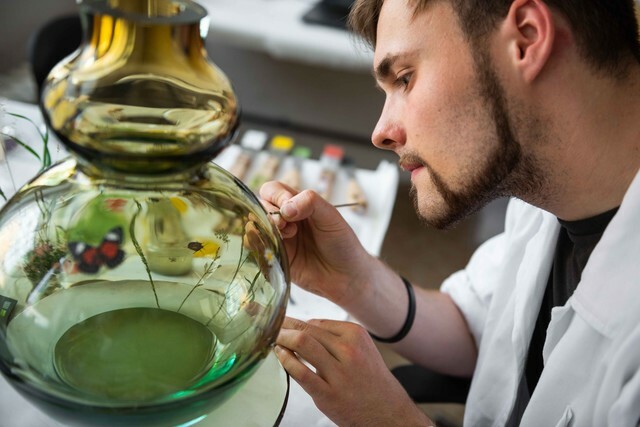 František studies third year at Studio of glass at Prague Academy of Arts, Architecture and Design. He graduated from secondary school in Třeboň, field of studies - glass painting. In his work he likes to work the most with hand painting on glass, but also other craft techniques. František says about his work: "I dip perfectly smooth brush into good quality colour, around me is the smell of terpentine, also resin and lavender, that can't be missed in the colour. I put brush on the surface of glass vase and with smooth movement create a flower. Hours and hours of work, until the artwork is done. I like to experiment with colour. Where is the borderline between craft and contemporary painting?"